The pituitary gland, also known as the hypophysis, is a major gland of the endocrine system. It secretes hormones that control the actions of other endocrine organs and various tissues around the body. In this article, we shall look at the anatomy of the pituitary gland – its position, structure and vascular supply. Fig 1.0 – The pituitary gland. 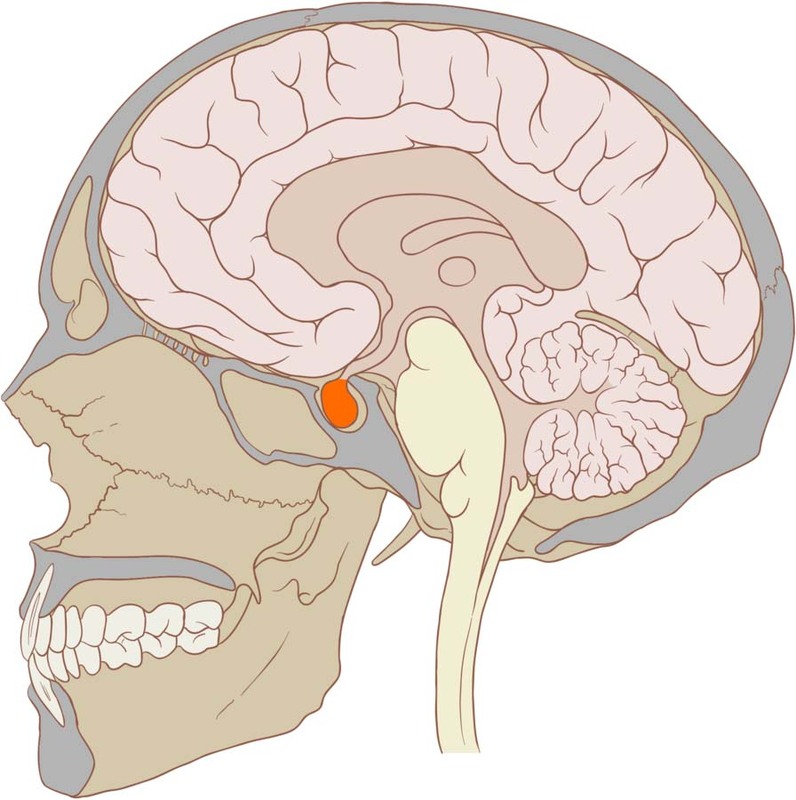 The pituitary gland is a pea-sized oval structure, suspended from the underside of the brain by the pituitary stalk (known as the infundibulum). It sits within a small depression in the sphenoid bone, known as the sella turcica (‘’Turkish saddle’’). The superior surface of the gland is covered by a reflection of the dura mater – the diaphragma sellae. This membrane has a central opening which allows passage of the infundibulum. 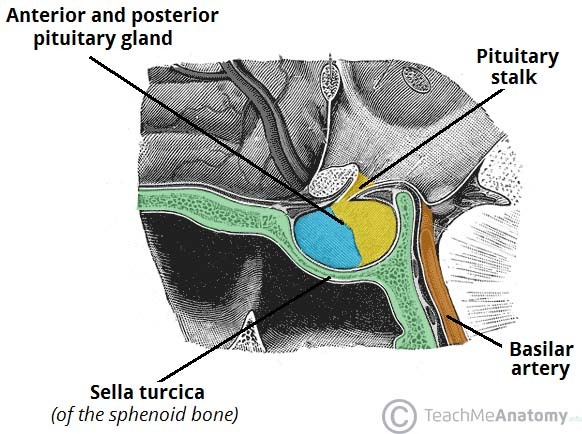 Anteriorly – sphenoid sinus (the pituitary gland is accessed surgically via the sphenoid sinus, known as a trans-sphenoidal approach). Posteriorly – posterior intercavernous sinus, dorsum sellae (posterior wall of the sella turcica), basilar artery and the pons. Superiorly – diaphragma sellae (fold of dura mater that covers the pituitary gland), optic chiasm. Fig 1.1 – Anatomical position and relations of the pituitary gland. A pituitary adenoma is a neoplasm of the pituitary gland. These tumours are usually benign, and can be divided into two categories; non-functional tumours and hormone secreting tumours. As the tumour increases in size, it can compress surrounding structures, such as the optic chiasm. A lesion of the optic chiasm characteristically produces a visual defect known as a bitemporal hemianopia. A pituitary tumour can also cause excessive hormone production, or insufficient hormone production (by destroying the normal glandular tissue). Definitive treatment of a pituitary adenoma is via trans-sphenoidal surgery. This technique involves gaining access to the gland via the nasal cavity and sphenoid sinus (which is located immediately inferiorly to the gland). Anatomically, the pituitary gland is a ‘’two-in-one’’ structure consisting of the anterior pituitary and the posterior pituitary. These parts have different embryonic origins and function very differently. Pars anterior – the largest part, responsible for hormone secretion. Pars intermedia – a thin epithelial layer that separates the pars anterior from the posterior lobe. 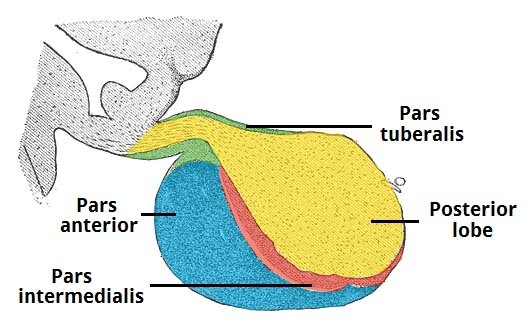 Pars tuberalis – an upwards extension of the pars anterior that surrounds the anterolateral aspect of the infundibulum. The release of hormones is under the control of the hypothalamus, which communicates with the gland via neurotransmitters secreted into the hypophyseal portal vessels. These vessels ensure that the hypothalamic hormones remain concentrated, rather than being diluted in the systemic circulation. The posterior lobe (neurohypophysis) consists of nervous tissue. It arises from the embryonic forebrain, and is, in essence, an extension of the hypothalamus. Upon stimulation, the posterior lobe secretes two hormones – ADH (responsible for control of blood osmolarity), and oxytocin (involved in parturition and milk secretion). Both of these substances are produced in the supraoptic and paraventricular nuclei of the hypothalamus and then subsequently stored in the posterior pituitary gland, ready for release. Fig 1.2 – The structure of the pituitary gland. The anterior pituitary gland receives arterial supply from the superior hypophyseal artery (a branch of the internal carotid artery). 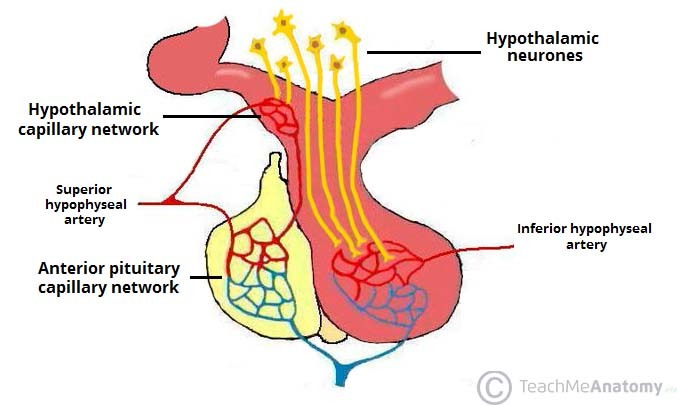 This vessel first forms a capillary network around the hypothalamus – blood from this network is then transported to a secondary capillary plexus surrounding the anterior pituitary. 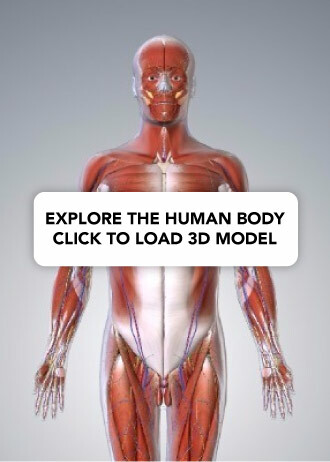 Known as the hypothalamo-hypophysial portal system, this structure allows the hypothalamus to communicate with the anterior pituitary via the release of neurotransmitters into the bloodstream. The infundibulum and posterior pituitary gland receive a rich blood supply from many arteries. Of these, the major vessels are the superior hypophyseal artery, infundibular artery and inferior hypophyseal artery. Fig 1.3 – The blood supply to the anterior and posterior lobes of the pituitary gland. Which of the following structures is located inferiorly to the pituitary gland? What structure can become compressed in a pituitary adenoma, leading to problems with vision? What part of the anterior pituitary gland is mainly responsible for hormone secretion?